McMaster University has been named one of Hamilton-Niagara’s Top Employers for the fourth year in a row. 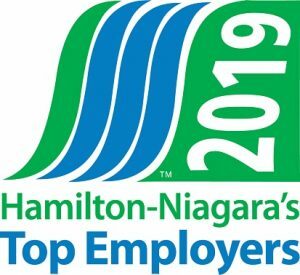 An annual competition organized by the editors of “Canada’s Top 100 Employers,” Hamilton-Niagara’s Top Employers is a juried designation that recognizes employers who lead their industries in offering exceptional places to work. This is the fourth time McMaster has applied to this rigorous competition – and the fourth time Mac has won. To be selected as a Hamilton-Niagara Top Employer, organizations are required to complete a lengthy application which includes: Physical Workplace; Work Atmosphere and Communications; Health Benefits; Financial Benefits and Compensation; Family-Friendly Policies; Training and Development; Vacation Policy and Paid Days Off; and Community Involvement. Read the reasons for McMaster’s selection as a top employer in the Hamilton-Niagara region. Learn more about how McMaster’s innovative, collaborative and inclusive community is helping to create a brighter world: Download the PDF titled “Learn More About Our Brighter World Vision” available on the home page of http://www.workingatmcmaster.ca. <a href="https://content.eluta.ca/top-employer-mcmaster" target="_blank" rel="noopener"><img class="alignright wp-image-85475" src="http://dailynews.mcmaster.ca/wp-content/uploads/sites/3/2018/11/hamilton-niagara-2019-english-413x378-300x275.jpg" alt="Hamilton-Niagara's Top Employer 2019" width="134" height="123" /></a>McMaster University has been named one of Hamilton-Niagara’s Top Employers for the fourth year in a row. An annual competition organized by the editors of “Canada’s Top 100 Employers,” Hamilton-Niagara’s Top Employers is a juried designation that recognizes employers who lead their industries in offering exceptional places to work. This is the fourth time McMaster has applied to this rigorous competition – and the fourth time Mac has won. “I’m grateful to all our employees for your invaluable contributions,” said president Patrick Deane. “You help to make McMaster a wonderful place to learn, discover and thrive.” “Our people are our greatest asset,” added Wanda McKenna, assistant vice-president and chief human resources officer. “Thank you for making McMaster such a great place to work.” This recognition follows other recent news that showcase McMaster’s strengths as a research powerhouse and a global leader in teaching and learning: <ul> <li>This summer, the university was chosen from 16 global finalists to win the prestigious <a href="https://dailynews.mcmaster.ca/articles/mcmaster-wins-global-teaching-excellence-award/" target="_blank" rel="noopener">Global Teaching Excellence Award</a></li> <li>In October, McMaster was named <a href="https://brighterworld.mcmaster.ca/articles/mcmaster-maintains-status-as-canadas-most-research-intensive-university/" target="_blank" rel="noopener">Canada’s most research-intensive university</a> for the second year in a row</li> <li>And once again, Mac is <a href="https://brighterworld.mcmaster.ca/articles/mcmaster-ranked-among-worlds-top-universities/" target="_blank" rel="noopener">one of the top 100 universities in the world</a> according to major global ranking systems</li> </ul> To be selected as a Hamilton-Niagara Top Employer, organizations are required to complete a lengthy application which includes: Physical Workplace; Work Atmosphere and Communications; Health Benefits; Financial Benefits and Compensation; Family-Friendly Policies; Training and Development; Vacation Policy and Paid Days Off; and Community Involvement. The annual competition is open to any employer with its head office in the Hamilton-Niagara area, and employers of any size may apply, whether private or public sector. Applicants may also submit in special national categories, such as: Canada’s Greenest Employers; Canada’s Best Diversity Employers; Top Employers for Canadians Over 40; and Canada’s Top Employers for Young People. Winners in these categories are announced separately throughout the year. <a href="https://content.eluta.ca/top-employer-mcmaster" target="_blank" rel="noopener">Read the reasons</a> for McMaster’s selection as a top employer in the Hamilton-Niagara region. Learn more about how McMaster's innovative, collaborative and inclusive community is helping to create a brighter world: Download the PDF titled "Learn More About Our Brighter World Vision" available on the home page of <a href="http://www.workingatmcmaster.ca">http://www.workingatmcmaster.ca</a>.